You will be fascinated and inspired by stories of more than 200 women saints. 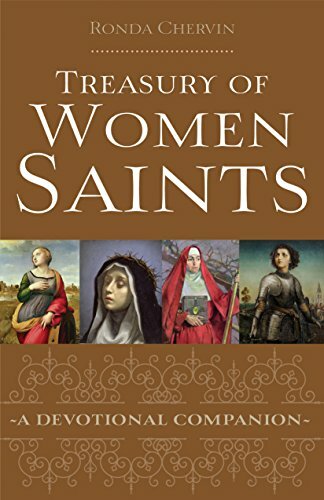 From mothers like Elizabeth of Hungary and prophetic saints like Hildegard of Bingen to mystics like Julian of Norwich, this treasury chronicles Catholicism's most beloved women saints from the early Church to modern times. Ideal for use in daily devotions, each entry provides a biographical sketch of one or more saints, a life application for you, and a prayer or dedication for the day. Ronda Chervin received a Ph.D. in philosophy from Fordham University and an M.A. in religious studies from Notre Dame Apostolic Institute. She is a widow, mother, and grandmother. Ronda converted to the Catholic faith and has been a professor of philosophy and theology at Loyola Marymount University, the Seminary of the Archdiocese of Los Angeles, and Franciscan University of Steubenville. She currently teaches philosophy at Holy Apostles College and Seminary in Cromwell, Connecticut. She is the author of Quotable Saints and Prayers of the Women Mystics.